A series of violent protests broke out in Pretoria over a disputed mayoral candidate for upcoming municipal elections. At least one person has died in the riots. 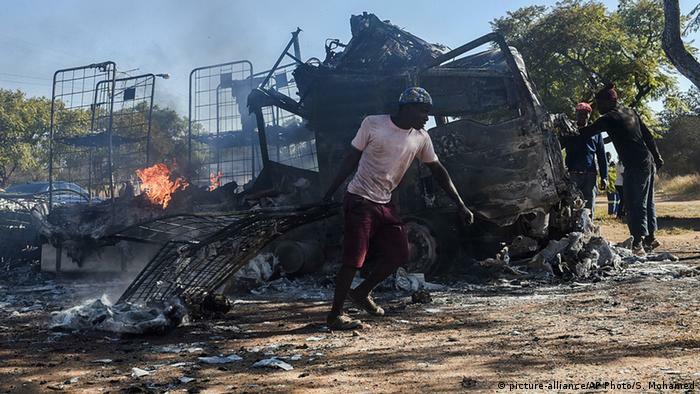 Widespread unrest erupted in the South African capital after the ruling African National Congress (ANC) published the name of its mayoral nominee for Pretoria to compete in local government elections to be held across the country on August 3. Similar protests had broken out earlier this month in the coastal city of Durban, KwaZulu Natal – the home province of President Jacob Zuma. Police refused to give details about casualties, but said they were investigating at least one case of murder, along with countless reports of malicious damage to property. According to local media reports as well ANC accounts, an ANC supporter had been shot during a party gathering in Pretoria on June 19. The person later died in the hospital. Several further deaths have also been reported from around the country in the run-up to the local elections. Protesters have been venting their anger over a mayoral candidate they say was imposed on them by the national ANC leadership. Incumbent Pretoria mayor Kgosientso Ramokgopa is expected to make way for Thoko Didiza, former Minister of Agriculture and Land Affairs under President Thabo Mbeki, for the August 3 elections. The ANC fears it could lose power in some major cities, as it continues to face allegations of corruption and cronyism. Years of headline news about the cost of Zuma’s taxpayer-funded upgrades to his Nkandla homestead appear have turned many against the current leadership. Zuma is yet to reimburse any of the costs; he has appealed against a court decision demanding that he pay back some of the funds. Zuma faces another 783 counts of graft charges. In the past year, there have also been numerous instances of violence and vandalism at a number of South African universities, as students took to protesting high fees. Despite its reputation as the “protest capital of the world,” recent protests in South Africa appear to have taken on a decidedly more violent streak. The Pretoria riots came just days after the 40th anniversary of the Soweto Uprising, which is remembered as “Youth Day” across South Africa.